Comfortable, two stateroom and two head Sea Ray Sundancer. Full, open salon with a lower galley, dining table and settee to starboard. 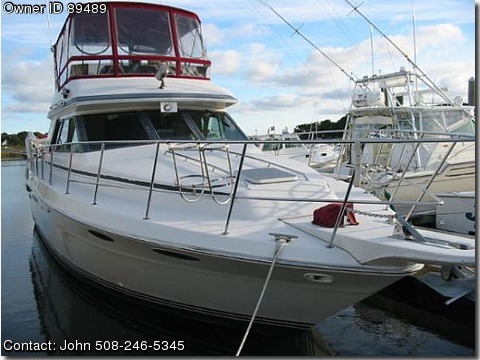 Spacious bridge and aft deck. Three zone Air-conditioning, reverse cycle heat. Twin 454 Mercruiser engines with only 900 hours. Recent professional mechanical servicing and updates. Please call for details and to inspect. Dimensions: Beam: 13 ft 11 in Maximum Draft: 3 ft 2 in Bridge Clearance: 15 ft 3 in Engines: Engine Brand: Mercruiser Engine Model: 454 Engine Hours: 900 Dimensions: Length Overall: 45 Displacement: 23,000 Engines: Total Power: T 340 Cruising Speed: 15 Max Speed: 19 Tanks: Fuel: 400 Fresh Water: 130 Holding: 40 Electronics: Raytheon 210 VHF Raymarine Loudhailer Raynav 550 Loran C docking lights Datamarine depth, speed ,log Sea Ray systems control Fireboy system Spotlight Mechanical update: Mechanic has recently completed service on engine intake, heads and elbows. Installing new ignition service, wires. 2 pumps changed. New sensor assemblies and tune up.